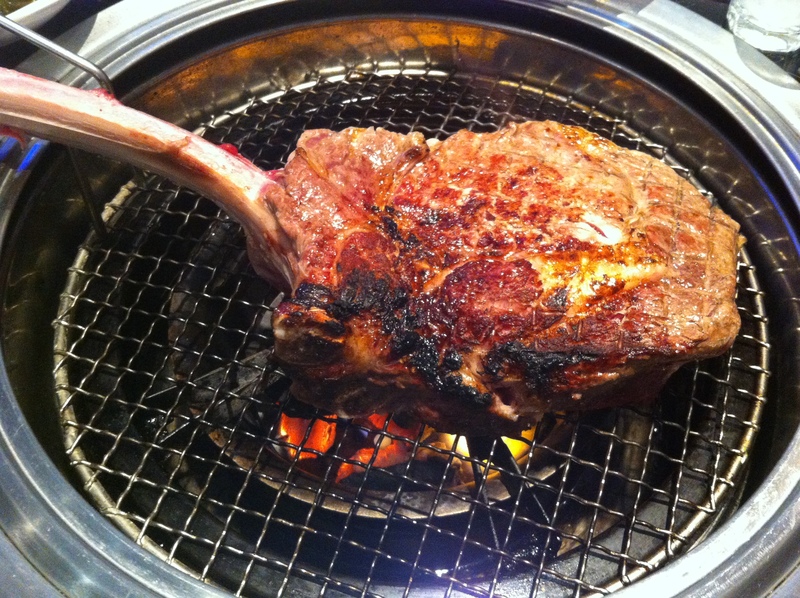 Korean restaurants are known for their popular barbecue where patrons grill their own pork, chicken and beef. This Koreatown restaurant adds a twist to the menu in that is serves Piedmontese Beef, which is grass-fed, free of antibiotics and hormones, and is ultra tender. Star King, which opened last July, offers cuts of brisket, boneless short ribs and rib-eye steaks. Many of their patrons are requesting the offals, too. We were seated at a table with a grill in the center, and served a bottle of refreshing roasted barley tea, mild with a slight nutty flavor. It doesn’t require any sugar or lemon and is caffeine-free. Known as a natural antacid, it helps with digestion. Side dishes of flash-fried potato salad, jalapenos in oil with dried anchovies, a spicy kimchi style cucumber salad, and a chewy dried spicy squid were served prior to the beef arriving for us to grill. I really enjoyed the clear glass potato noodles with a slightly sweet sauce and sautéed vegetables. The seafood pancake filled with calamari and baby shrimp was also an interesting dish. A platter of raw beef was presented with thin slices of boneless short rib, brisket and a 2 ½ to 3-pound bone-in center cut rib-eye. Piedmontese beef has a third less calories and fat as regular beef. It’s richer in Omega 3 and Omega 6. Authentic Korean restaurants offer scissors to cut beef, not knives. The scissors are very practical and easier for the servers to use. The Piedmontese beef arrives with three dipping sauces. There is a powdery Korean salt and pepper, jalapeno with ponzu and a spicy radish sauce. As our meat sizzled on the grill, we sipped sake and a sweet Myung Jak Bokbuna raspberry wine. Sitting at the grill table is a fun, interactive dining experience to enjoy with family and friends. Star King is located on the corner of Wilshire and Western. Park for free in the garage structure behind the restaurant, they will validate. The Metro Purple Line is located across the street at Wilshire and Western. Open seven days a week for lunch and dinner until midnight. 3807 Wilshire Blvd. #120 (213)384-5464. Published in the 5/23/13 issue of the Beverly Press and Park LaBrea Newspapers.